So which story do you prefer? "The one with the tiger. That's the better story," said the writer, who had invaded Pi Patel's space to learn and ultimately a great film. It is a film of grand beauty, delivered by fantastic is recount his beautiful life story to the rest of us. And that is what makes Life of Pian incredible story of life triumphing over adversity ... magnanimous adversity. 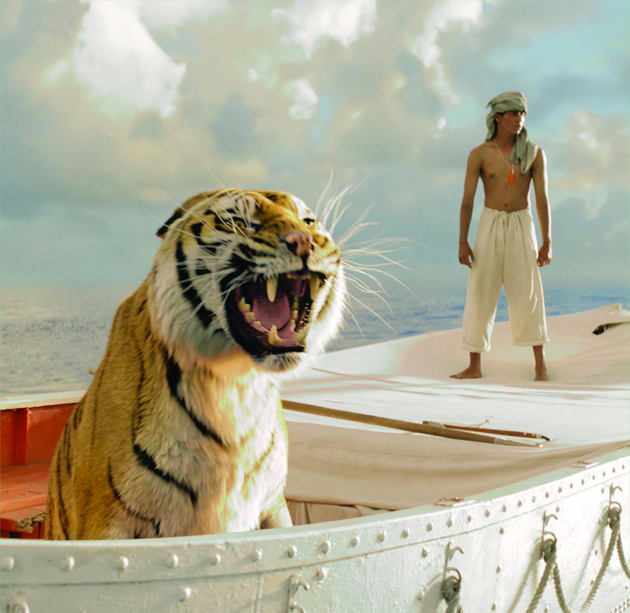 At the eventual nexus of all this adversity and magnificent beauty is a shipwrecked pre-adolescent Indian boy named Pi Patel and a hungry, frightened Tiger, named by a clerical error as Mr. Richard Parker. Pi Patel met the Bengal Tiger, Mr. Richard Parker, as a younger boy in India when his father was owner of and caretaker for the animals in the municipal zoo in their city by the sea, Pondicherry. It was an intense first meeting, where Pi sought to make friends with this ravenous beast by feeding it a morsel of food, with his young, still attached hand. The optimistic boy was naive to a tremendous fault at best, and completely unprepared to understand the dynamics of the power and the absolute carnivorous cunning of this beast of the wild. 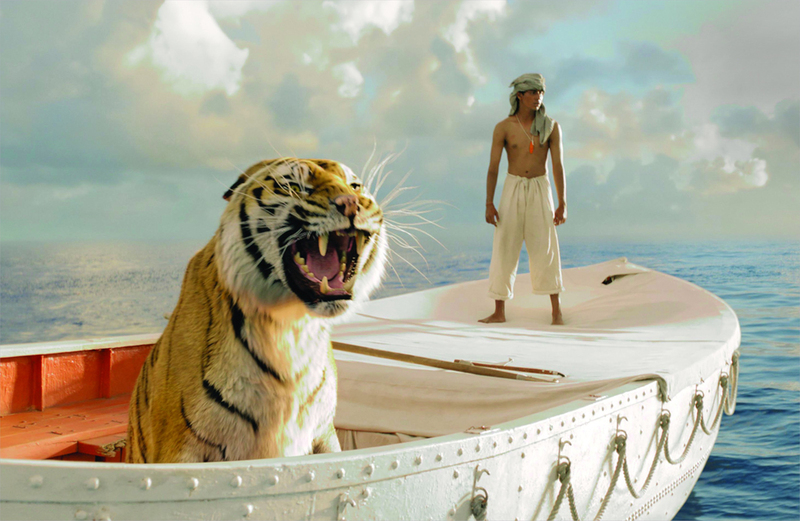 Fortunately for Pi, his far less sophistic father, played by Adil Hussain, saved Pi, played by Ayush Tandon (Pi at 11 years old), from becoming the main course for Mr. Richard Parker at worst, or simply losing his hand at best. The ambitiously precocious Pi Petal, played by Ayush Tandon, struggling to know God and life: Above. The pre-adolescent to adolescent Pi, played throughout the balance of the film by Suraj Sharma: Below. 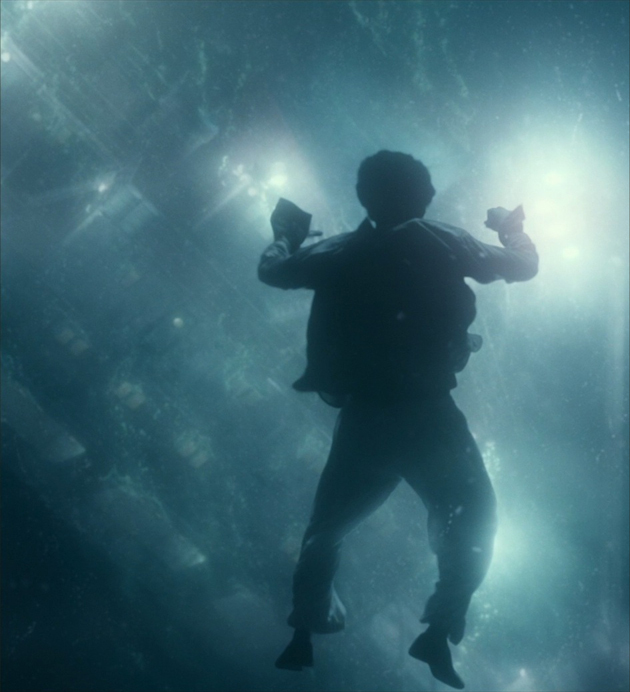 Famed director Ang Lee used a beautifully written David Magee screenplay that successfully reduced the fantastic story originated by novelist Yann Martel to breath cinematic life into an incredible tale of human adaptation to an impossible situation that inspires the best within us to understand, with great trepidation, the triumph of life over capitulation by this outstandingly sympathetic young hero. Director Lee's great success in making all this work was his introduction of Pi Patel from a young boy to his pre-adolescent status of the shipwrecked Pi. 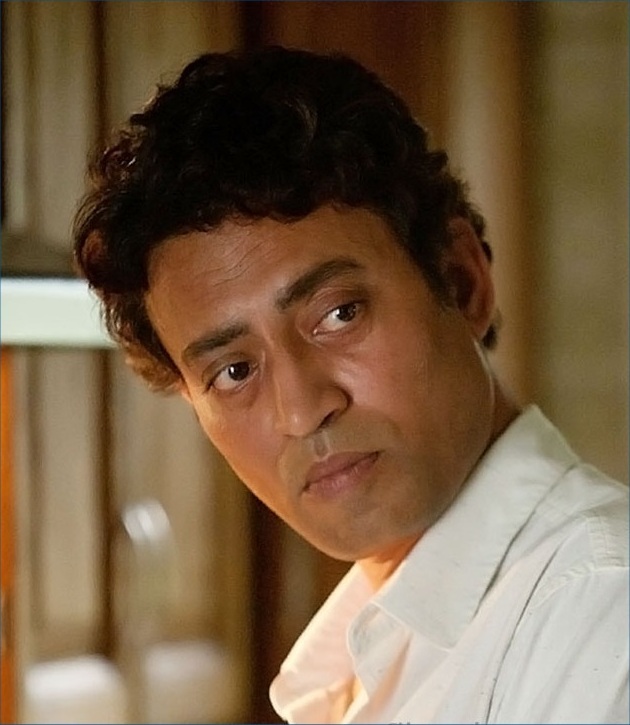 While much of the film was dedicated to Pi Patel's self identity under the most severe circumstances: a near death, life altering transformation into a survivor of consummate skills, with the spirit to acquire the sense to survive, was built upon the precocious depth of Pi's understanding of life as a mere boy. Pi Patel at 11 years of age, developed a sweetened soul, which lent perspective to his transforming older self under such an intense ordeal of months lost upon the Pacific Ocean. He became a man of great wisdom with a wife and family of his own living in Canada which was ultimately his father's last wish. 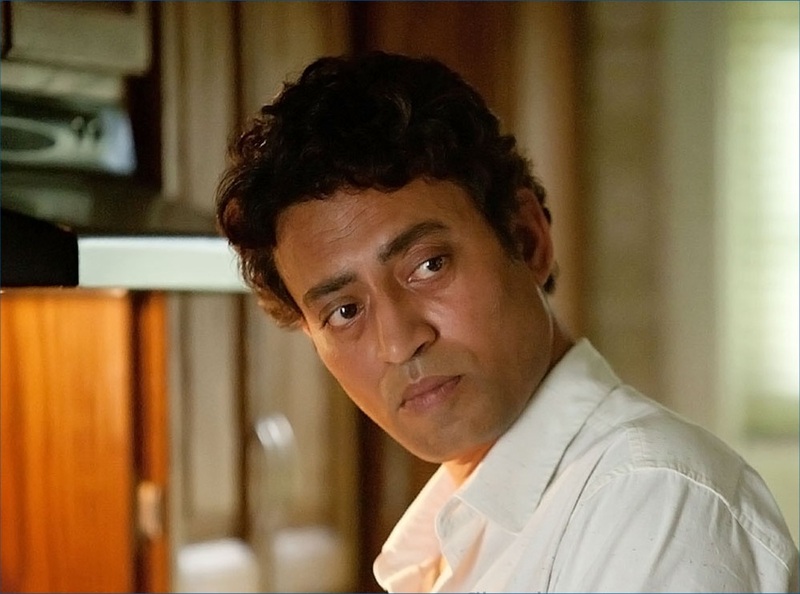 Pi Patel as an older man, played by Irrfan Khan, living in Canada, and telling the story of his life: his attainment for a path of wisdom, the shipwreck, as a castaway, and Mr. Richard Parker - a "story to make one know God": Above. The sinking ship and a submerged, and displaced Pi from the inevitable horrors of this mass drowning. Click the images to enlarge. Between the tragic sinking freighter, and Pi Patel eventually growing into a respectable man with a wife and children in Canada was a grand story of an irrepressible will to survive over the great adversity of being lost at sea upon a lifeboat with a ravenous Bengal Tiger. 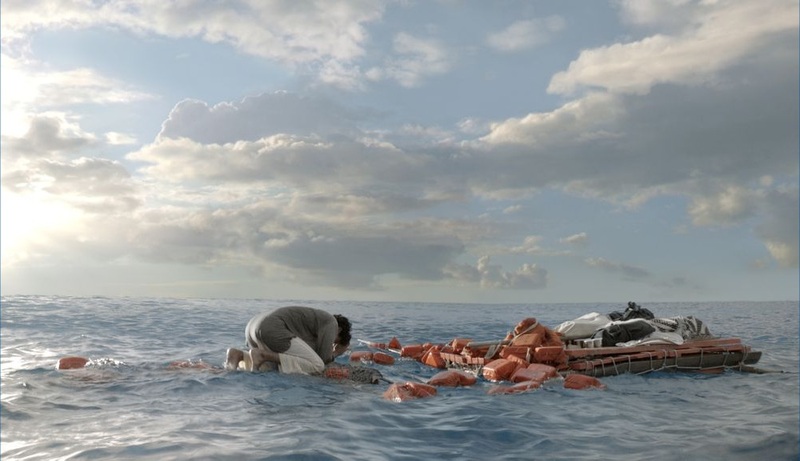 This was a tale of Pi's fantastic personal discovery of purpose amid the ever-oppressive dangers that nature, in all of its grandeur, does well provide - especially at sea. Pi Patel, now a castaway, in the throes of great sorrow and consternation as to how to proceed with his tremulous life: Above. 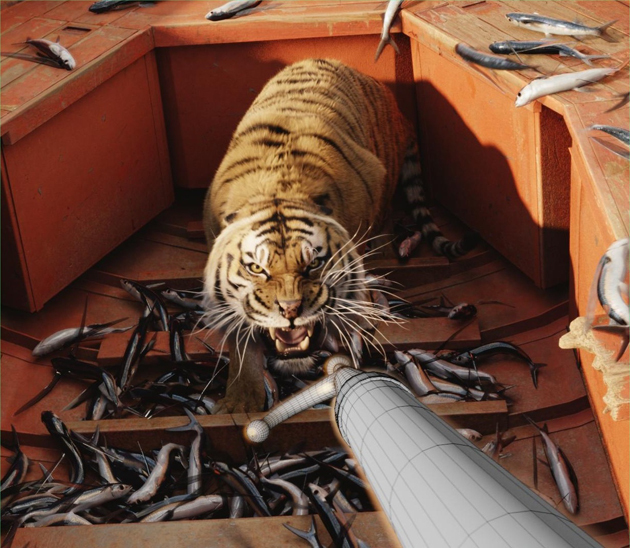 Pi attempts to gain some control over Mr. Richard Parker, when a school of flying fish arbitrarily find their way into Pi's lifeboat, or, if should one accept the two story motif, over himself: Below. Click the images to enlarge. It was a discovery that led Pi to draw upon his wealth of spirit that he soulfully developed as such a bright and intuitive child. 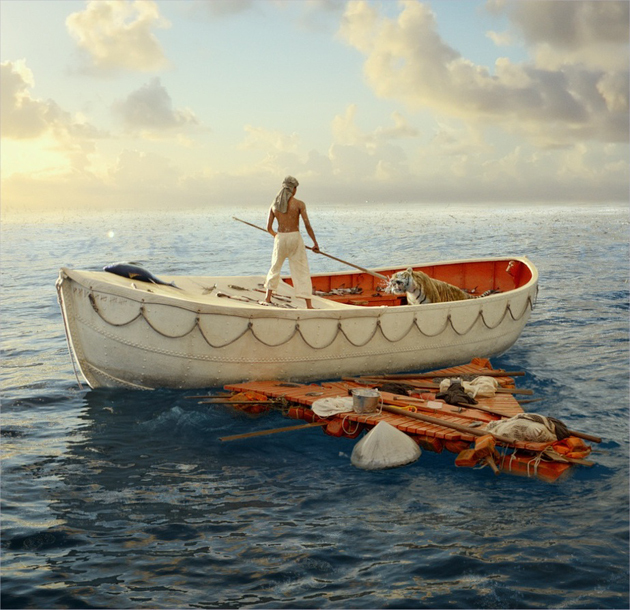 Pi Patel not only did survive his terrible tribulation upon the massive waters of the Pacific, but grew in spirit immeasurably to tell his beautiful story. This was a lovely tale of hope and purposeful perseverance, filmed in robust celluloid, where Pi's adversity was still a feast for the eyes of the audience. 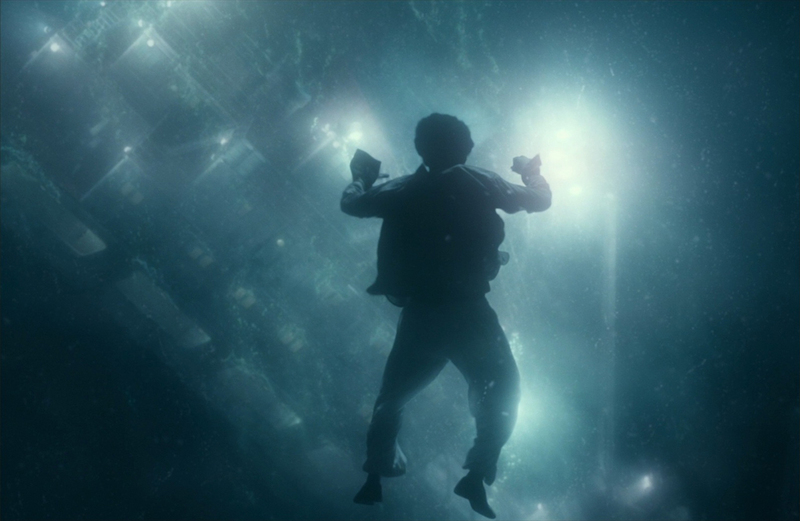 The overwhelming design and computer graphics placed this visual epic in the forefront of the audience's senses, suspending any sense of disbelief, and captivating our innate desire to be part of Pi's experience, his story. 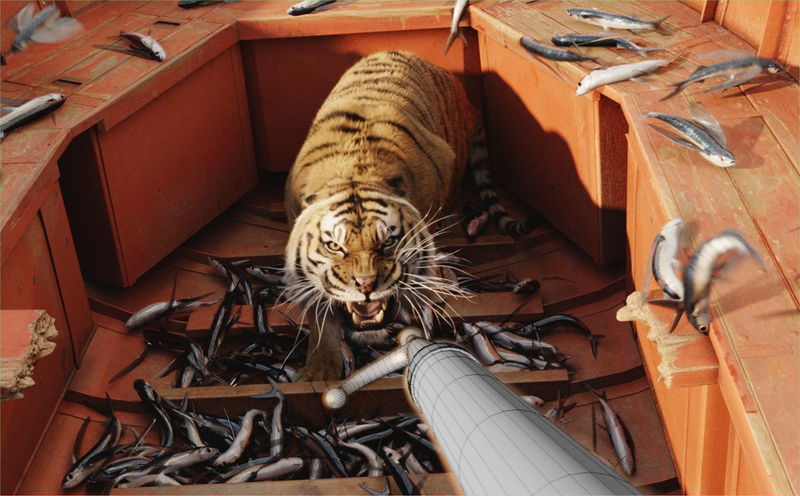 Pi Patel, with that cache of flying fish all about them, in the process of gaining control over Mr. Richard Parker: Above. And then, eventually gains control over the Bengal Tiger ... or is it himself? Click the images to enlarge. 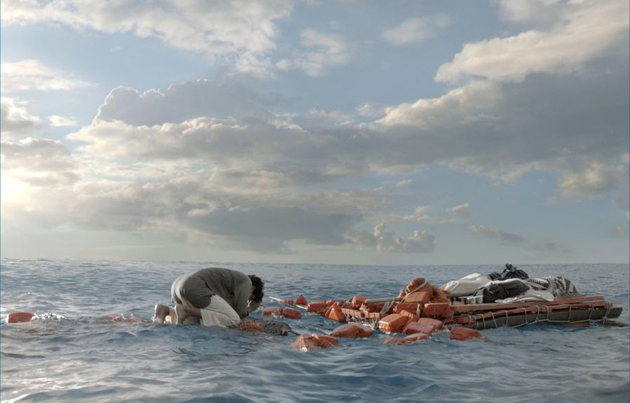 As it is in most wonderful stories, there are highs, and yet so many lows in this film, with so many days adrift at sea, and at some point, there are multiple inflection points. 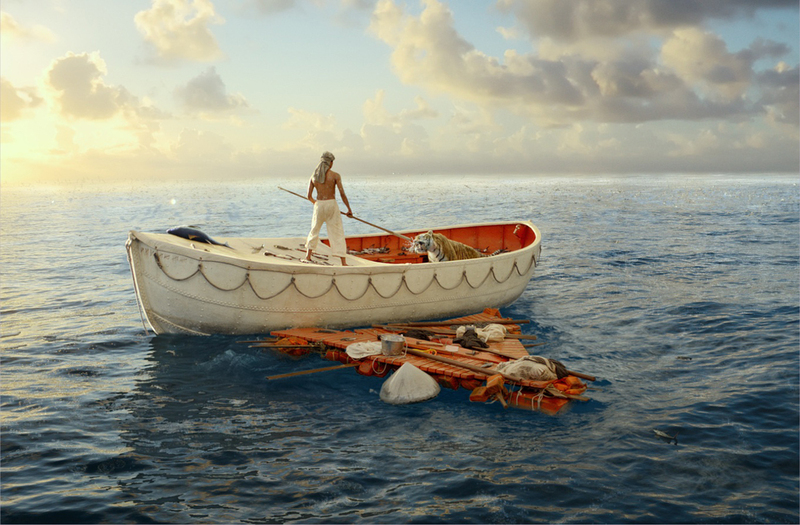 And so it was after one of the terrible storms at sea, where it did appear that Mr. Richard Parker no longer had any desire to survive against these insurmountable odds to do so. With Pi enjoying some measure of control over the carnivorous tiger, he sought to nurse Mr. Richard Parker as best he could; however, his efforts were immediately buoyed by Pi's discovery of a floating island, loaded with edible fruit for Pi, and multitudes of meerkats for Mr. Richard Parker.